If someone claims asylum they get their day in court. Kids usually stay in the US for good. That's what most are trying to do, but that avenue is being blocked by Trump. Do you think that those people waiting in line to be processed for months are trying to crawl into the US in the middle of the night? Honestly, I don't know what it is. Somewhat disturbing. Be Best. It was silly. and the media reacting to it is silly. When dealing with these absolutely dangerous pigs, it ALL matters. Nearly 2,000 children have been separated from their families at the US border since the start of the Trump administration's new “zero tolerance” policy on illegal immigration, according to new figures from the Department of Homeland Security. Certainly, the cruelties of immigration control are nothing new, and nor are they exclusive to Republican Presidents. The inhumanity of this latest drive still deserves condemnation, nonetheless, especially given the chilling 'God on our side' defence offered by Sessions and Huckabee Sanders. What a scary bunch of bastards. 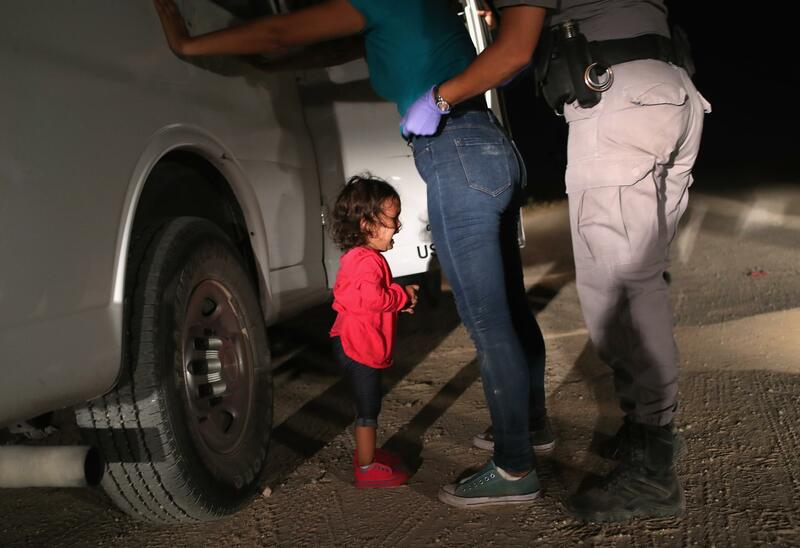 I think it is a profound affirmation of the truth that exists that the picture used in this post is of a little girl and a mother who have now been confirmed to not be separated. There is so much misinformation on this topic it is not even funny. IF there is an increase in the number of children separated from their parents, it is because the law is actually being followed and people commiting crimes are being incarcerated. Since the children cannot go to jail with the parents, we unfortunately have to do something with them. What should be questioned are all the ignorant people who still don't know that "Animals" comment was not about immigrants, it was about MS-13. Do you REALLY not know that? Even if you believe that, how do you explain the numerous other bigoted statements uttered by Trump? MS-13 the new right wing boogeyman that Trump has absolutely now idea about. What a sick bunch of fucks these right wing monsters are. Oh, and Trump is so well spoken and so full of brilliant comments that it really is wondrous that people would misconstrue the absolute bile that spews from his disgusting mouth. The masters of distraction and deception glom onto one thing and keep ramming it down our throats. They're doing it now with the 2014 picture of 2 unaccompanied minors that they are selling as Obama being as bad as trump. It's all they've got. Sick stuff. Many of these families have actually proven to be genuine asylum seekers and therefore were not breaking the law. They are not criminals, and regardless it is still morally WRONG to take their children away from them just because they are seeking better lives. The law is wrong in considering such people criminals. I was once sent back to the UK after an 11 hour flight to the States, just because my passport (newly issued by the French Consulate in London) was not numerical. Was my passport valid? Yes, it was brand new. Was I a criminal? Not in the slightest. Yet the immigration officers treated me like a piece of dirt and detained me for four hours, then sent me back on the next flight. Was I even seeking asylum? Not at all, I was on holiday coming to visit an old friend in Arizona. He had driven a long way to collect me from the airport and I was not even allowed to go and tell him what was happening. YES they are THAT cruel. What you must understand here is that the people in power are not on ANY people's side. They are guided by politics, hatred and ignorance not intelligence or love and just stupidly apply the rules without taking ANY circumstances into account. Anyone who applies rules without thinking is dangerous. This is not fake news, this is real. Wake up! then they should have saught it in Mexico. You are embarrassing yourself Only. no, that is a fact, if they were actually in danger then why not seek it in Mexico? If Mexico is a good country they would be happy to take them no? No, we should take them because they are great people, unlike the dirtbags who support Orange Hitler. Seeking aslyum in our country - trekking 2000 miles to make a better life for yourself and your children is a crime? OK, let's say so - it is a misdemeanor. Usually it means giving up your wallet and personal effects which you have returned to you once released. Taking away your child with no plan to return them to you? How can that make sense? It doesn't - it is simply wrong. She is out of order no matter what or who she was sending a message too. On the surface one would think it's just a cool jacket for fashion but with her and her husband every thing they do is fake. They don't like the media that won't kiss their asses. And they don't want any media to question them. Why are they mad at the media when the media is one of the reason they are in office. All he can do is talk about illegals this and immigration that trying to use those things as a scapegoat to for America problems. He is lucky he did get the mess that Obama go. Both Trump and his wife is out of order. I'd gladly trade them for disgusting, garbage Trump supporters. The picture in the article is not tagged as you imagine, it does not say the picture is of one of the 2,000 - It is the other pictures in the article of the children in cages that show the profound and undeniable truth. The profound affirmation of the truth is that it is undeniable that the processes being used are cruel and evil to the point that Trump has made moves to distance himself from them once the outrage became public. What is horrible is that you still don't understand people who are refugees are escaping worse things than the chance of being separated for indeterminant periods. It is in how we treat those most downtrodden that we are judged, not how desperate the downtrodden have been made before they arrive seeking relief. Exactly. And protecting my wife and child from harm takes precedence over any country's laws. They started deporting some of the adults but their children are still being detained? WTH. Give them their kids back. I don't really see grasping for a technicality about a news photograph as demonstrating anythine "profound", tbh. There have been plenty images of children being held in cages, and statistics that indicate the scale of the issue. And, despite talk of "misinformation", I don't see those truths being contested anywhere in the post. Likewise, there's no "IF" about the increase in numbers, unless you have good reason to believe that the DHS is faking them. It all sounds suspiciously like a reluctance to acknowledge the facts. Clutching for the comfort of an ethic of "personal responsibility" in a situation like this seems almost like one of those Harry Harlow monkeys cleaving desperately to its ragged ersatz 'mother' to hide from the disturbing presence it has encountered. It seems tragically inadequate. Personal responsibility applies only to the extent that meaningful choices are available to an individual in a particular situation; otherwise, it's just a ploy by the fortunate to rationalise their own engendered privilege by spuriously attempting to pass off their more auspicious lot as the fruit of their own 'superior' personal decisions. We're talking about people running from desperate situations here. You're in no position to sit in judgment at least until you know what fate was awaiting their children had they stayed. And we can all invoke the sanctity of law. But the Christian tradition gives us plenty to contest that Pharisaical rationality. Law exists to protect human life or it has no legitimacy. When it lacks that legitimacy, we should, in Pauline terms, be faithful not to the letter of the law but to its spirit, "for the letter kills, but the spirit gives life", as it were. your opinion is just as insignificant as it stinks. and I say they should have sought it in the USA. touche. and now? That brings up the question, of what is wrong/what is happening in these other countries. There is a gray area of discussion that needs to be had. Like people who are pro abortion vs pro life, well what about pro prevention, that will handle both sides. Mexico and these Central American countries need to be made accountable. 2053 children have been separated from parents. Our government has no idea which kids belong with which parents. There is no plan to reunite families. They are asking for 2 more tent detention centers on Texas military bases. You know, the ones that cost $775.00 per person per night. We could send every kid to college for that. Private contractors are RAKING IT IN. Follow the $$. And The United States should be made accountable for their complicity in the problems in these Central American countries. History can be very inconvenient for your average self righteous, unaware, selfish, "christian" American. Sad but true. Blame the victim instead of the violence being done to them. And now OrangeTrash is trying to make immigration itself illegal by abolishing due process before a judge, treating those arriving as criminals and shipping them back immediately.